Clean, smooth surfaces, and an uncluttered appearance characterize contemporary style interior design. The modern look is a world away from the fussy interiors beloved of our ancestors, but contemporary design doesn't have to mean a home you're afraid to live in. Forget clashing patterns and garish patterns: contemporary homes are characterized by their cool, muted color palettes, featuring a lot of whites, creams, and darker shades, including brown, taupe and mauves. Sticking to this very modern color scheme, however, doesn't have to be boring: try adding a splash of color to your white walls with a vibrant painting, or add a brightly colored chair of sofa to draw the eye. Accents of color can also come from cushions, rugs, throws or ornaments, which add interest to what could otherwise be a plain looking room. Shiny metal, polished wood and cool tile are the textures you'll most often find in the modern home. Floors are most often wood or tile, although rugs are often used to add both warmth and color to a room. Chrome finishing on furniture and fixtures - particularly in bathrooms and kitchens - also help create a very modern look, as does glass, which is used to great effect by many contemporary style interior designers. To soften up this rather hard textural feel in your home, try adding some different textures: a faux-fur cushion, a velvet throw, or a set of silk drapes will make an interesting contrast to the rest of the look. Surfaces in the contemporary home are clear and uncluttered. Resist the temptation to litter your surfaces with pictures in frames, ornaments or other clutter: instead, a few, well chosen ornaments in striking colors will make the most impact against the clean walls and smooth lines of the modern home. Contemporary style design is easy to achieve if you know what you're looking for. Follow these tips to make the most of the rooms in your home. Invest in a good platform bed as the focal point of your bedroom design. Platform beds consist of a mattress directly on a platform with no box spring. The result is a cleaner, simpler design that is lower to the ground. Keep your bedding tucked in and sleek with minimum throw pillows to accentuate its clean lines. Stick to dressers, bureaus and other furniture with clean lines, sharp angles and a rich, dark color to fade into the background of the design. Give the color to the walls and the accent pillows on the bed and contrast the dark wood with a white duvet to make the colors of the room pop. 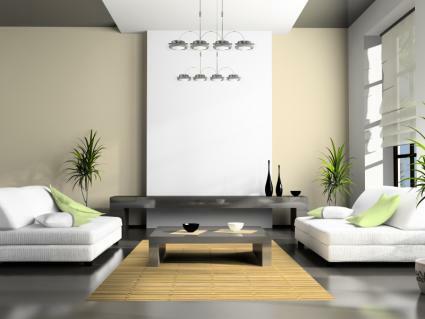 Keep your living room as clean, open and uncluttered as possible to create a contemporary feel. Sleek leather couches and chairs paired with glass and chrome coffee and end tables can help formalize the space. Break it in a little with some dramatic art work, or abstract throw rugs on the floor. Keep the flooring relatively bare with either hardwood planks or oversized tiles to create the illusion of space; toss throw rugs only around the seating area to create a cozy conversation nook. The kitchen gets the most use out of any room of the home. Make it the contemporary show point of your home with slab cabinet doors, a sleek solid surface countertop and lots of clean lines and angles. Oversized tiles on the floor mixed with machined glass tiles on the backsplash will open up the room and reflect light. Add some pendant lights to enhance this and don't be afraid to experiment with color here; red cabinets or blue glass tiles can light up the whole room. One thing modern homes tend not to have is that "lived in" look we're so used to. In fact, some contemporary homes can look more like showpieces than family homes. Contemporary style interior design can create some challenges for the home owner to deal with, but try to remember that the whole purpose of contemporary design is to create a living space which is, above all, functional. Wood floors don't just look nice: they're also much cleaner than wall to wall carpeting. And while that uncluttered space can create a nightmare when it comes to finding storage space for all of your belongings, contemporary interior design provides the answer to the problem. Modern storage solutions include under-bed storage, attractive, stackable, storage containers, closet organizers and other wonders designed to help create that minimal look whilst providing storage space that's anything but minimal. Stores like Ikea are your best friends when it comes to contemporary style interior design and are chock full of everything you'll need from clever storage systems to funky chairs and minimal style furniture. Not every home is made to handle contemporary furnishing or interior design. Begin with rooms that are large, open and devoid of any intricate crown moldings or beadboard. The end result of your contemporary design should be airy, open and clean. Keep this in mind as you design to form a home that melds function and beauty into one.